How to get there: Follow signs for the South Link and Airport and you will join the R27. After passing Cork Airport, three miles further on at the Five-Mile-Bridge take the R600 to Kinsale town. I was at the very first Kinsale Gourmet Festival in the mid 70’s when it was a fledgling event but, like Topsy, it just growed and growed, along with it Kinsale’s reputation worldwide on the foodie scene. A pivotal part of this foodie arena has always been the Blue Haven Hotel, which was run like a very tight ship and into which everybody seemed to report at some part of the day. We have had great nights there with people from all over the world in Kinsale for shark fishing, the food, sailing or just the fun of the whole place. In fact on one occasion we had such an hilarious stay it took us three days to leave! We got up each morning with the best of intentions but, we would meet someone we knew, and after a couple of “farewell” jars couldn’t set off to drive to Dublin so, back we would have to go to Reception, and beg for our room, or any room! 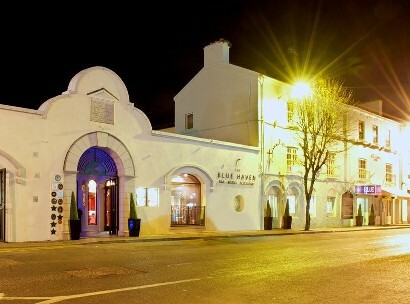 Local guy, Ciaran Fitzgerald, is now at the helm of the Blue Haven and has spent the past two years revamping and restoring it into a very fine atmospheric and welcoming Boutique Hotel. All of the very stylish bedrooms have had a major face lift to bring them in line with the requirements of today’s discerning traveller - flat screen TV’s, those really expensive beds, pillow menus, wild wood furniture, wireless broadband and spanking newly fitted bathrooms. There is a new relaxed yacht like bistro off the sleek recently revamped bar, which is like a luxury liner, as well as the Blue Haven Restaurant, where I have spent many a good night including ringing in the New Year with gusto! The food is modern, well executed and just what is wanted nowadays. The food is modern, well executed and just what is wanted nowadays. You can think perhaps of lobster, scallops, or prawns, partnered with good Mediterranean vegetables, asparagus, artichokes, aubergines and followed by scrumptious puds. Really good food is available all day so if you want to be at the hub in Kinsale – The Blue Haven is the place to be – you never know if you are lucky like me it might take you 3 days to check out!